Have you ever heard of AVB Switches? Do you know something about the Cisco AVB Switches? Recently, Cisco updated the IEEE802.1 Audio Video Bridging standard supported on select Catalyst 3850 & 3650 platforms. What is Audio Video Bridging? Cisco has announced IoS XE Software Release 16.3 in Q3-Q4 2016 to support the IEEE 802.1 BA AVB standard on select Cisco Catalyst 3850 and some Catalyst 3650 platform switches. These Cisco AVB Switches deliver the highest-capacity 1, 10, 40, Gigabit Ethernet ports in the industry. 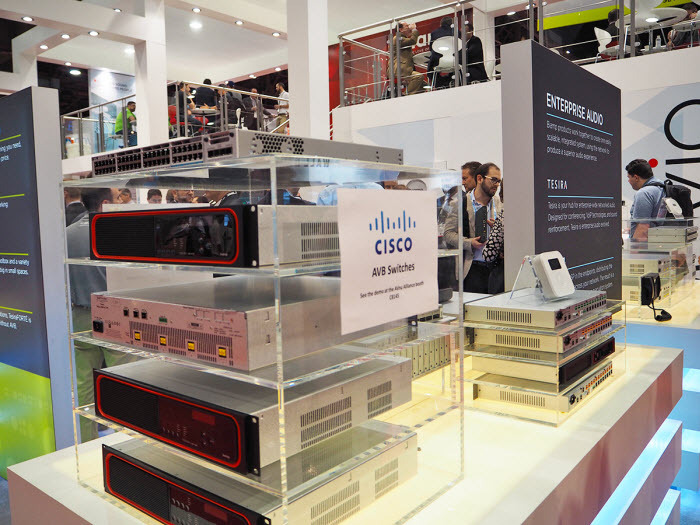 These different Cisco Catalyst platforms supporting AVB, including the C3850 MultiGigabit 36x1G switch model where AVB is supported on 1G port and uplink port only, while the C3850 10Gig SFP+ switches with 12, 16, 24, 32 and 48 ports support AVB on all ports. Also, the C3650 24×48 Gigabit mini switch offers AVB support on all of its 12 or 24 ports (PoE capable) with 2x1GSFP, 2x10GSFP and 4x10GSFP+ uplink options. More Notes: This announcement adds to the Cisco Nexus 7700 high capacity platform switches, which have been confirmed in March 2016 to support AVB/TSN, delivering 10, 40, and 100 Gigabit Ethernet ports, as required for video applications and by the broadcast industry. AVB (Audio Video Bridging) is the common name for the set of technical standards developed by the IEEE Audio Video Bridging Task Group of the IEEE 802.1 standards committee. This task group was renamed the Time-Sensitive Networking Task Group in November 2012 to reflect the expanded scope of its work. IEEE 802.1 defines a set of standards that provide the means for highly reliable delivery of low-latency, time-synchronized AV streaming services through Layer 2 Ethernet networks. AV migration to an Ethernet infrastructure was recognized as a means of addressing the needs of professional AV equipment in addition to lowering total cost of ownership (TCO) and enabling transparent integration of new services. Currently, however, the deployment mechanism lacks flexibility and interoperability. To accelerate the adoption of Ethernet-based AV deployments that are interoperable, IEEE developed the IEEE 802.1 Audio Video Bridging (AVB) standards. This standard defines a mechanism whereby endpoints and the network function as a whole to enable high-quality AV streaming across consumer applications to professional AV deployments over an Ethernet infrastructure. The transition from non-networking (non-Ethernet and non-IP, like HDMI) to networking (Ethernet and IP) has already started. AV and production media and controller solution builders are already moving to take advantage of this standards-based transition, seeking not only lower TCO (no more license fees), but also scalability (more efficient deployment, installation, and management) to enable new services and capabilities. Many switch and endpoint vendors support for IEEE 802.1 AVB. Starting from Cisco NX-OS Software Release 7.3, Cisco supports the standard on Cisco Nexus 7700 platform switches, which include capacity at 10, 40 and 100 Gigabit Ethernet ports. The AVB switch, or bridge, is an Ethernet switch that complies with the IEEE 802.1 AVB standards. The AVB stream is a data stream associated with a stream reservation that complies with SRP. The IEEE 802.1BA specification requires an AVB talker to be grandmaster capable. In a typical deployment, a network node can also be the grandmaster, provided that it can either source or derive timing from a grandmaster-capable device. An IEEE 802.1AS network timing domain is formed when all devices meet the requirements of the IEEE 802.1AS standard and communicate with each other using the IEEE 802.1AS protocol. The clock of one device is chosen as the reference clock for synchronization purposes. This device is referred to as the grandmaster. The device also must provide the timing to the AVB network using IEEE 802.1AS. Figure 2 shows a simple AVB network with its components. …How to use Cisco AVB for Enterprise Networks? Firstly you should know that the goal of a Cisco AVB enterprise network is to limit the analog AV signal as much as possible and push the Ethernet-based AV network as far as possible within the enterprise. In the following part we will discusses several Cisco AVB deployment use cases and network designs for an enterprise network. In a contained AVB deployment, the space is built using discrete and local equipment closets with the AVB systems and the AVB switches. Auditoriums and multiple-purpose rooms are examples of contained AVB deployments. 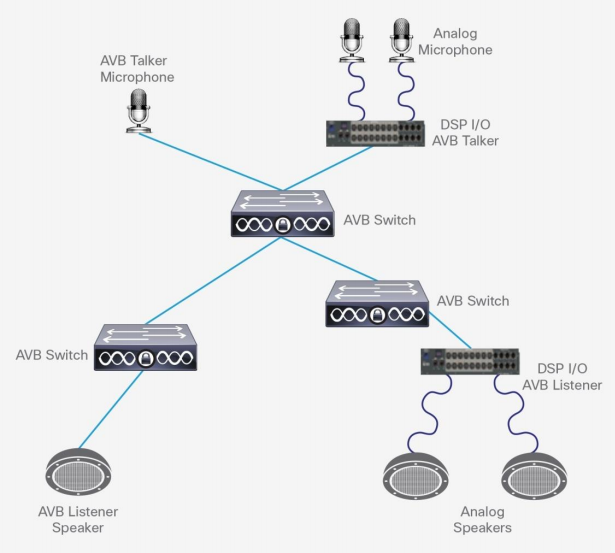 Figure 6 shows the analog microphones and ceiling speakers that are aggregated by AVB I/O devices. These are then converted to Ethernet AV traffic to be passed through the AVB switches. In an interconnected multiple-floor deployment, multiple spaces or rooms across floors in a building have installed AVB systems and AVB switches interconnected across multiple floors. Figure 7 shows an example of a multiple-floor building with AVB switches connected across different floors. Video can also be distributed over an AVB network. One deployment example is a video recording and distribution system. The cameras record the events and then send compressed/uncompressed video over the AVB Ethernet network to the recording center in a central location. The deployment can range from small scale (one-floor courtroom) to large scale (multiple-floor service building). Other video distribution examples include video media delivered to a lobby or a video wall and video broadcast from an auditorium to a cafe. 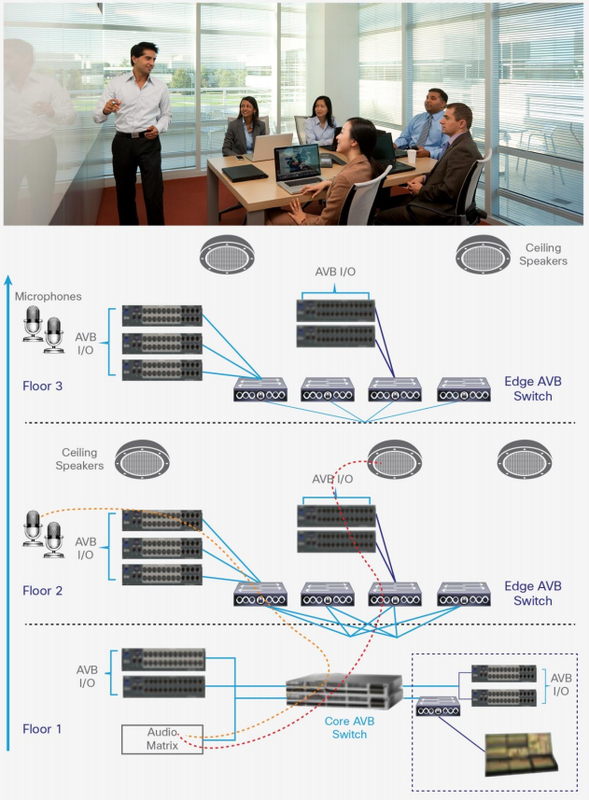 Audio Video Bridging is supported on select Cisco Catalyst 3850 and 3650 Series mini switches. Either an IP Base or IP Services license is required. Note that currently AVB is not supported on stacking switches. WS-C3850-12x48U: For Cisco IOS XE Software 16.3.1, AVB is supported on the 36 1 Gigabit Ethernet copper ports and uplink fiber ports. For Cisco IOS XE Software 16.3.2, AVB is supported on the other 12 mGig copper ports as well. WS-C3850-12x48U supports full IEEE 802.3at Power over Ethernet Plus (PoE+) and Cisco Universal Power over Ethernet (UPOE), which can power the AVB endpoints that are POE capable. WS-C3850-24XU: The 24 copper ports on WS-C3850-24XU are mGig ports. AVB is supported on all ports with Cisco IOS XE Software 16.3.2. WS-C3850-24XU supports full IEEE 802.3at PoE+ and UPOE, which can power the AVB endpoints that are POE capable. WS-C3850-12XS/WS-C3850-16XS/WS-C3850-24XS/WS-C3850-32XS/WS-C3850-48XS: These C3850 models are 10 Gigabit Ethernet SFP+ models. AVB is supported on all ports with Cisco IOS XE Software 16.3.1. Audio and video equipment deployments have traditionally been analog, single-purpose, point-to-point, and one-way links. As deployments migrated to digital transmission, they retained the point-to-point, one-way link architecture. This dedicated connection model resulted in a mass of cabling in professional and consumer applications, which was hard to manage and operate. Migration to an Ethernet infrastructure was recognized as a way of addressing the needs of professional AV deployments in addition to lowering TCO and enabling transparent integration of new services. Audio Video Bridging is a set of technical standards developed by the IEEE 802.1 standards committee. IEEE 802.1 defines a set of standards that provide the means for highly reliable delivery of low-latency, time-synchronized AV streaming services through Layer 2 Ethernet networks. 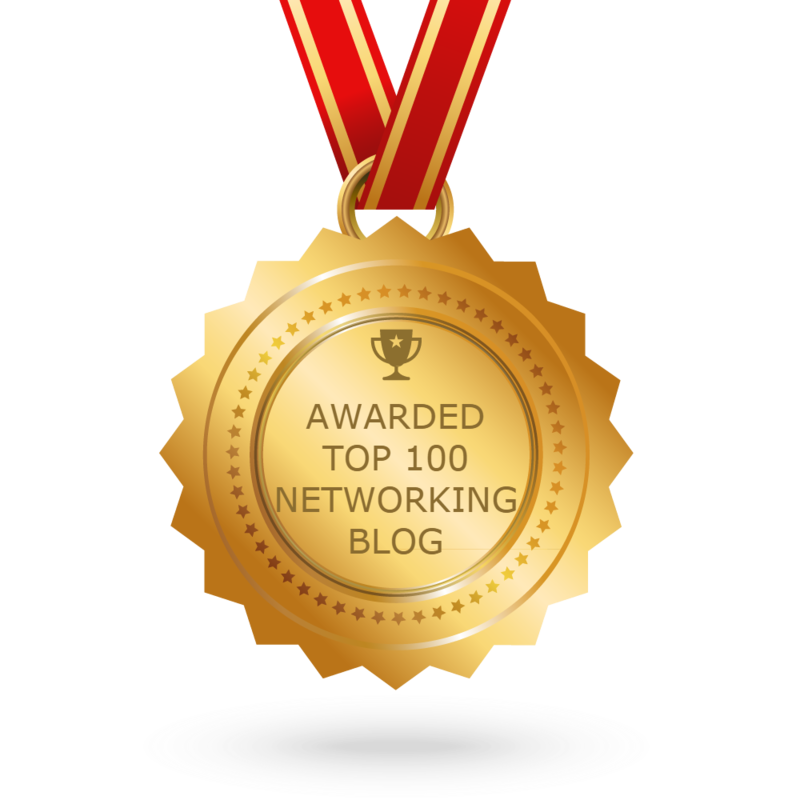 The standardization helped accelerate the adoption of Ethernet-based AV deployments in enterprise networks. With an AVB-capable endpoint and switch, analog AV signals are aggregated at AVB endpoints and transmitted on shared Ethernet infrastructure. The design is flexible, scalable, simple to operate, and cost effective. 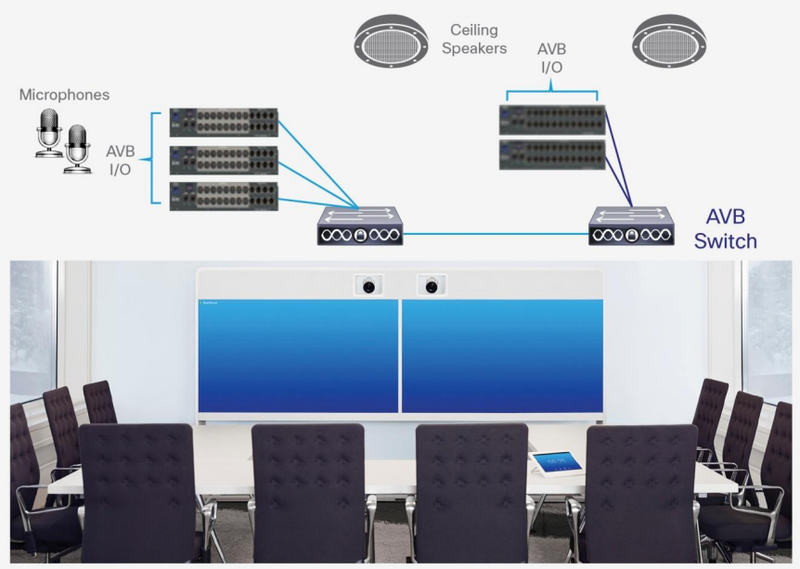 With a Cisco AVB enterprise network solution, professional AV installations that previously required extensive time and resources to connect proprietary or noninteroperable network elements now benefit from a simplified network, reduced implementation costs, unified management, converged infrastructure, and standards-based designs for audio and video application integration.